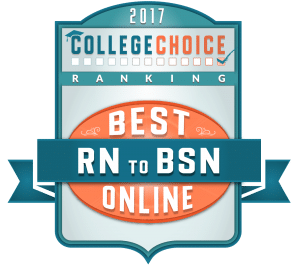 Registered nurses with an associates degree can advance their careers by obtaining the Bachelor of Science in Nursing degree online. The purpose of the RN-BSN Online Completion Program is to prepare the graduate for entry into professional practice as a generalist who cares for persons as individuals, members of family/groups, and as communities in both structured and unstructured health care settings. The mission of the Department of Nursing is to provide students with opportunities for intellectual growth, cultivation of skills for critical thinking, and the communication and skill development for career preparation in a global environment. The Department of Nursing is committed to meeting regional health care needs by preparing graduates who demonstrate competency as health care practitioners. Students previously enrolled in another RN to BSN Completion nursing program must forward a letter requesting transfer and attach copies of all unofficial college transcripts. Students who are requesting transfer from another nursing program are also required to provide a letter from the program dean/chair/director of eligibility to reenter their previous nursing program in order to be eligible for consideration in the SAU nursing program. Transfer credit will be considered on an individual basis. Our graduates can communicate and collaborate effectively with colleagues, individuals, families/groups, and communities to provide cost effective, quality nursing care. Our graduates improve the healthcare system operations and accountability. Our students understand the role of the physical environment. Our students participate in a racially and culturally diverse society. Our graduates engage in critical thinking, independent judgment, and decision making while using the nursing/research process to design and evaluate the effectiveness of nursing care. Our graduates integrate technology to critique and apply research findings to improve nursing care in a variety of health care settings. Our graduates apply appropriate knowledge and skills synthesized from the humanities, social, physical, and behavioral sciences in meeting the physiological, psychological, spiritual, and sociocultural needs of individuals, families/groups, and communities across the life span. General Education* – 27 hours(Sciencecourses are included in the major.) PHIL 2403 Introduction to Philosophy and PSYC 2003 General Psychology are required. Be admitted to SAU with regular or conditional admission status and/or maintain a cumulative 2.00 GPA at SAU. Be a graduate from a *NLN-AC/ACEN or State Board of Nursing approved Associate Degree Program or diploma program, and meet general education requirements. Students are encouraged to complete all general education requirements prior to enrolling in upper division nursing courses. Students who have completed SPCH 1113: Introduction to Speech, PHIL 2403: Introduction to Philosophy; and SOC 3183: Statistics may be allowed to enroll in the upper division nursing courses. Have transcripts evaluated by nursing faculty if transferring from another college or university. NOTE: SAU’s Department of Nursing follows the Arkansas Nursing Articulation Model for transfer credits in nursing; however, courses taken at community colleges are not counted as part of the junior/senior hours required for graduation at SAU. Possess an unencumbered state license to practice in the state in which the clinical experiences will be obtained. Have proof of Hepatitis B vaccination, Flu shot, TB screening, and current American Heart Association CPR certification. To comply with mandates from clinical agencies utilized by the SAU Department of Nursing, students enrolled in all nursing programs are required at the initial semester of enrollment and yearly thereafter to have criminal background checks, driving history record checks, and urine drug screens in order to remain enrolled in any nursing course. All screenings are conducted at the expense of the individual student. More information and pricing as well as student instructions [pdf] are available. Realize if an injury occurs in the clinical setting, the student is responsible for all applicable cost related to the injury. Students are strongly encouraged to obtain health insurance. Submit a completed Department of Nursing application according to the deadlines posted on the nursing website. Application forms may be obtained from the Nursing Department or you can complete the online application form. Or deliver to Wharton Nursing, room 201A. 13. Full-time or part-time options available. *Graduates from non NLN-AC/ACEN- accredited nursing program will be evaluated for admission on an individual basis.